Sydney’s Botany Bay holds a special place in Australian history as the spot where Captain Cook arrived in April 1770. He claimed the eastern shores of Australia for Great Britain and called it New South Wales. The First Fleet arrived from England at Botany Bay in 1788 – and these days overseas visitors arriving at Sydney Airport do the same thing (without being convicted of anything, of course). Both headlands, north and south, are National Parks. To the north, Cook is celebrated. To the south, the La Perouse Museum tells the story of Frenchman Jean-Francois de La Perouse, who arrived in Botany Bay just a few days after the First Fleet. Cook was not the first European to set foot on the continent – that honour is granted to Dutchman Willem Janszoon (William Jansz), who landed in the Gulf of Carpentaria in 1606. Botanist Joseph Banks, who was with Cook on that historic day, insisted he change the name of the bay from Stingray Harbour to Botany. Also, Captain James Cook didn’t land at Botany Bay; he was a Lieutenant when he arrived in 1770. Later, when he visited Tasmania and New Zealand, he was a captain. 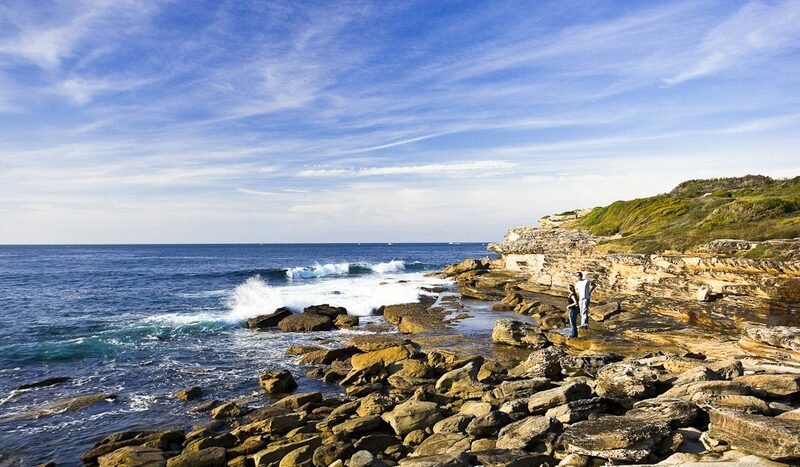 Botany Bay National Park is 15 km from the centre of Sydney. The northern section of the park is at the end of Anzac Parade in La Perouse, while the southern section is on Captain Cook Drive in Kurnell.